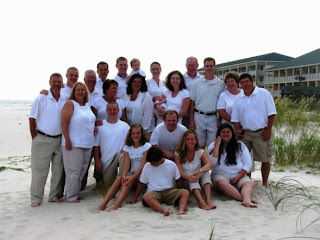 We made the short trek to Dauphin Island, Alabama for a family reunion with my mom's whole side of the family. We had fun introducing Nolan to all of the family. Jeremy and I were blessed to have so much help with him that week. Jeremy got to play several rounds of golf and I enjoyed some time on the beach and some good reading. We also got hooked on Lost. My parents brought Season 1 along for the week, and pretty sure Jeremy and I are now half way through Season 3 :) During the week Nolan took his first bottle and even made it through the movie "My Sister's Keeper." I can't wait to kiss that baby!! What a good lookin family! So how was the movie? I still haven't seen it. I'm nervous because I know it will be so sad! 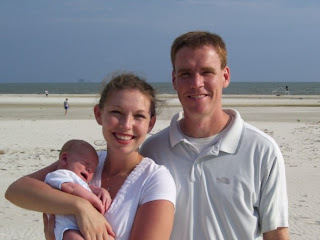 I am sure the family LOVED meeting that sweet baby boy! Love this! So glad that Nolan did well at the beach. Cole is quite the beach bum too!! what a great family picture hannah!! i love it!!! i'm glad you got to catch up on reading and get addicted to LOST!!! ahhh...it's sooo good! :) Did you like the movie! i loved the book so much, I don't know how the movie will compare!! anyways, love ya! Sweet pictures Hannah...what a special time for your family to be together! I want to meet your baby! Love the family picture! Lookin' good Mama! Can't wait to see you all.